South of Sunrise Hwy, approximately 2 miles from the Church. Please remover all Christmas decorations by the end of January. If the trash cans are full, place grave blankets and wreathes along edge of the nearest road. During winter months we have stronger winds, freezing temps and snowfall. All of these weather factors may dislodge the decorations on your family grave, resulting in the loss of a sentimental item. Also, many families exceed the 18” from headstone limit for placing decorations. If we have significant snowfall, the burial crews will unintentionally drive over (or destroy) your decorations wile preparing a nearby grave for a burial. Last January we had a Nor’Easter snow storm with over a foot of snow on the ground for over 2 weeks. 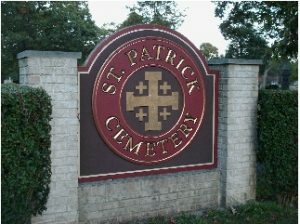 Please keep in mind our cemetery is active 12 moths of the year. Rules & Regulations for the Cemetery available at the Office.